As the Casas household is already decorating for Christmas, I decided to sneak out back and light up a cigar. This week’s choice is the limited edition Daruma made by Room 101/Camacho cigars. 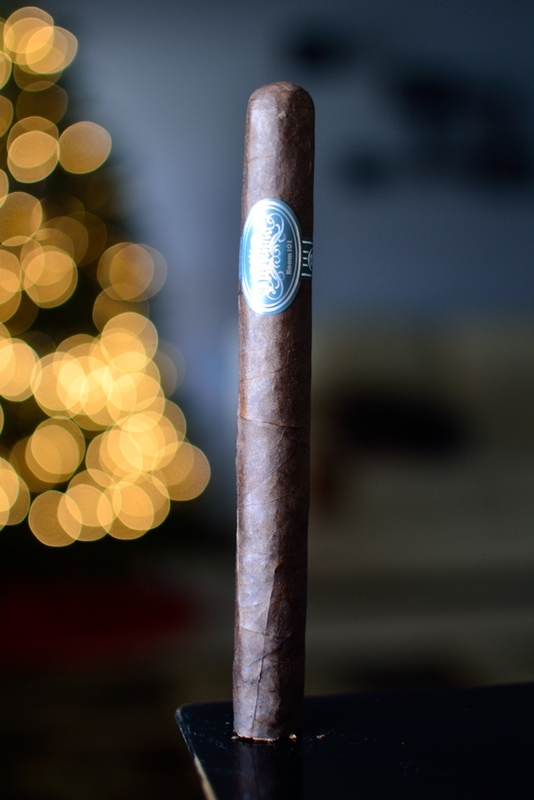 The Good Stuff: The Daruma is another brain child from Mr. Matt Booth over at Room 101 cigars. Matt teamed up with Camacho cigars a few years back and has taken the cigar industry by storm with his amazing blends, and crazy design and marketing ideas. Gotta love the artwork and attention to detail this man puts towards everything that he does. 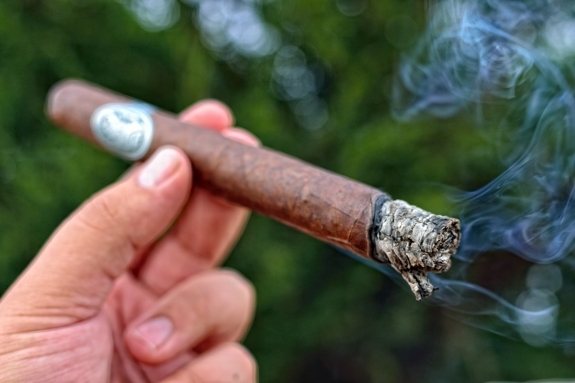 The Daruma starts out with a crazy dark Ecuadorian Habano wrapper, bound by Cuban seed Brazilian leaf, and filled with a mixture of Honduran and Dominican tobaccos. The Daruma comes in 5 different sizes: Monstro – 5 x 60, Roxxo 4 x 48, Papi Chulo 4 x 42, Mutante 7 x 38, and the Sucio 7 x 48. This is a limited edition run and only 20,000 cigars in each format will be released ranging in price from $6.25 – $10.25 a stick. I picked up a few of these cigars at Tobacco Tin a while back. Great Selection they got going on there. “The single eye I have penciled in on my Daruma doll is my silent reminder that I have set a goal that is pending completion. My Daruma will become a bi-oculared character once my task is complete. I have one year in which to complete my task – and if one of my attempts should fall short of victory I will not quit, but rather try again. Because, I know that if I do not give up and my will does not falter it is never a question of “if,” but only a question of “when.” We have named our latest series after the Daruma as he symbolizes resilience – a key ingredient to our success. Use your Daruma to set a goal of your own. 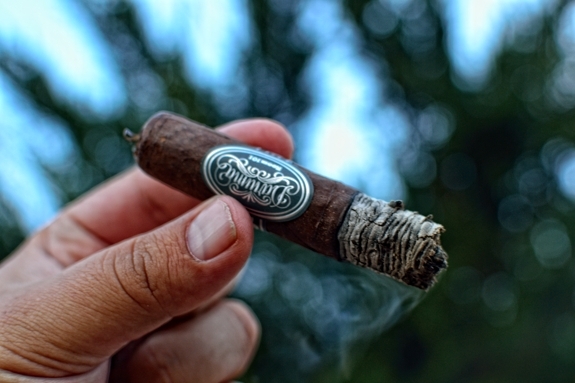 Prelight: The Room 101 Daruma is a very mean, very dark, very meaty cigar. The Daruma starts off with a crazy dark, very consistent dark brown wrapper. It’s really hard to find anything more than a few tiny, webby veins with a bit of darker color to the wrapper surrounding them. The Daruma is very heavy, very big, and very firm. 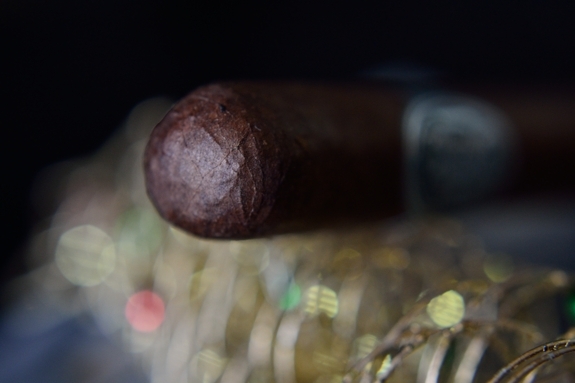 The only soft spots seem to be around the food of the cigar. The cigar is then polished off with a round double cap, and an absolutely beautiful grey and silver band similar to what we saw on the OSOK except it reads “daruma” in a crazy typeface similar to the Namakubi’s. I LOVE these bands. The wrapper on the Daruma gives off a nice, very potent spice and cedar aroma while the foot releases a crazy sweet berry and tobacco mixture. The cap cut very easily and clean using my double bladed Palio cutter. The cold draw produces a really nice cedar, spice, berry and tobacco flavor. Almost identical to a mashup of what aromas the cigar kicked out before it was cut. First Smoke: It took a whole lot of convincing from my single flame torch to get this Daruma lit, but once I did it was off to the races. 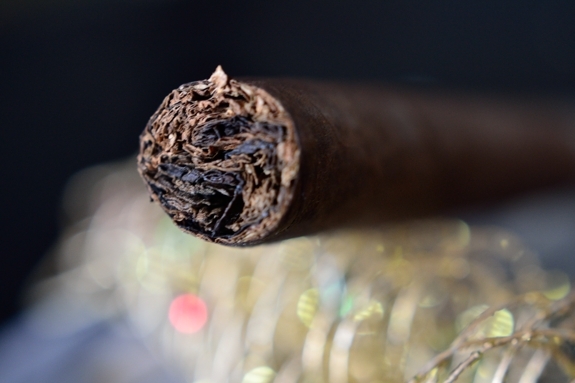 This cigar lets loose serious amounts of thick smoke with every tiny puff. Perfect draw. 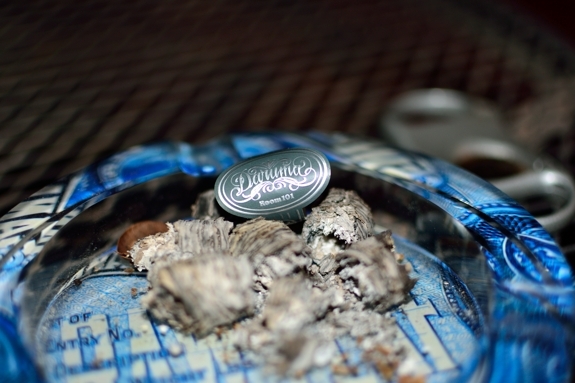 The Daruma starts out with some incredibly sweet tobacco, deep cedar, cherry, and lots and lots of spice. I’m impressed with the amount of flavor already present in this cigar. The burnline is incredibly sharp and dead even leaving behind a trail of flaky, medium gray ash that only held on for an inch before giving way. Halfway There: It’s strange that I didn’t pick up any pepper in the first third, but as this cigar progresses I taste more and more of it on the tip of my tongue. The cedar is in full control now mixing up beautifully with the sweet tobacco, spice, cherry, and now some interesting chocolate notes. The retrohale is crazy strong coating my nasal passage with straight up pepper and spice. I don’t find myself doing it too often. It kind of burns. Despite the cigar being crazy full body up to this point, I am feeling nothing in the nicotine department. We’ll see how that changes as I approach the final third. Finish: A lot of the flavor has dropped out of this Daruma into the final third. That’s not a bad thing though. With so much cigar it’s not that it is finishing so smooth and creamy. Leading the pack is the cedar backed but spice, soft chocolate and tobacco. The pepper has completely faded. Along with the body dropping, the small amount of strength has dropped out a bit too making for an incredibly smooth finish. This is how all cigar should end. This cigar took a little under 2 hours to finish and left me feeling absolutely no nicotine kick at all. Overview: Matt Booth does it again. I am a fan of Room 101, but even then I go into his cigars always a bit skeptical due to marketing. The last few times he has exceeded my expectations and the Daruma is another notch in his belt. This cigar starts out bold and complex, with nice switchups during the experience and a smooth finish with a perfect burn the entire time. What more can you ask for? Despite the higher price tag I would still coin this blend as boxworthy especially since they are limited edition. Get them while you can! Pairing: MMmm match made in heaven. 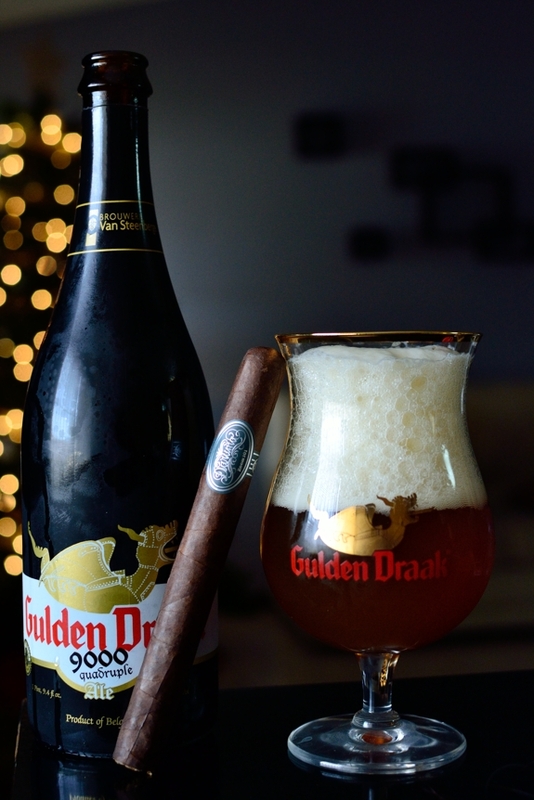 I paired this Room 101 Daruma with a beautiful Belgian beer, Gulden Draak’s 9000 Quadruaple ale. This 10.7% percent power house strong ale is brewed at the Brouwerij Van Steenberge N.V. in Belgium. Starting off with a beautiful orange/red amber color this beer has me written all over it. The beer starts off very smooth and sweet with notes of apricot, banana malt, and caramel. The flavors are so fruity and smooth they completely mask the alcohol content in this beast. Now imagine those same flavors with some cedar and spice with hints of cherry that the Daruma added. Heaven I tell ya. This was a perfect pairing. Another beer style that would go great with this cigar is a heavy abbey or even a mellow barely-wine. Thanks, another spot on review. It seems you often review sticks that I have enjoyed. I have a request, I like to print out the reviews, would it be difficult to add a print button ( with and without pictures) ? 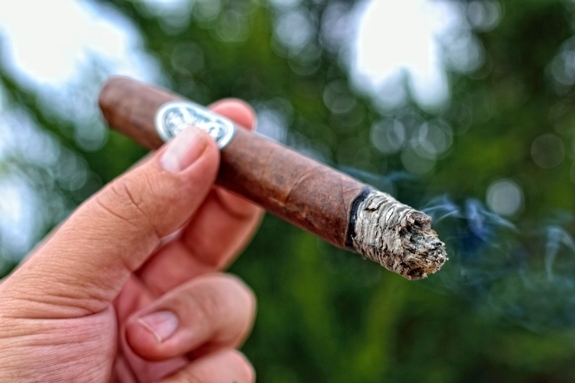 Just got done smoking the Daruma Mutante size, and damn was it good!! Been smoking a lot of them lately. Was wondering if you’ve tried it yet and which size do you prefer, I love lanceros, and the sucio was my size of choice on the Namakubi being that its under 50 ring gauge. Awesome review as always Tony!! The Lancero is the only size I haven’t had. I usually like smaller ring gauges but this blend seems to rock in the larger ones. The Sucio is my favorite so far!